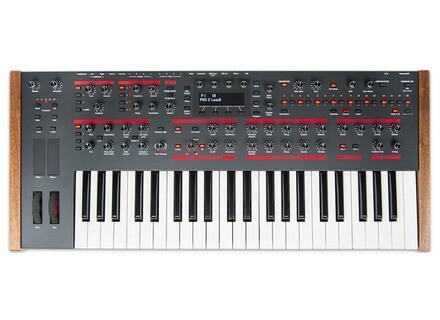 Pro 2, Hybrid synthesizer from Dave Smith Instruments. revega's review (This content has been automatically translated from French)"NEW PROPHET !!!" The Pro 2 is the latest in the series inaugurated by Dave Smith Prophet via Sequential Circuits in 1978 with the first of all, the Prophet 5. More than 35 after the series is always a guarantee of quality and still stands singularly competition both in its technical aspects and sound. 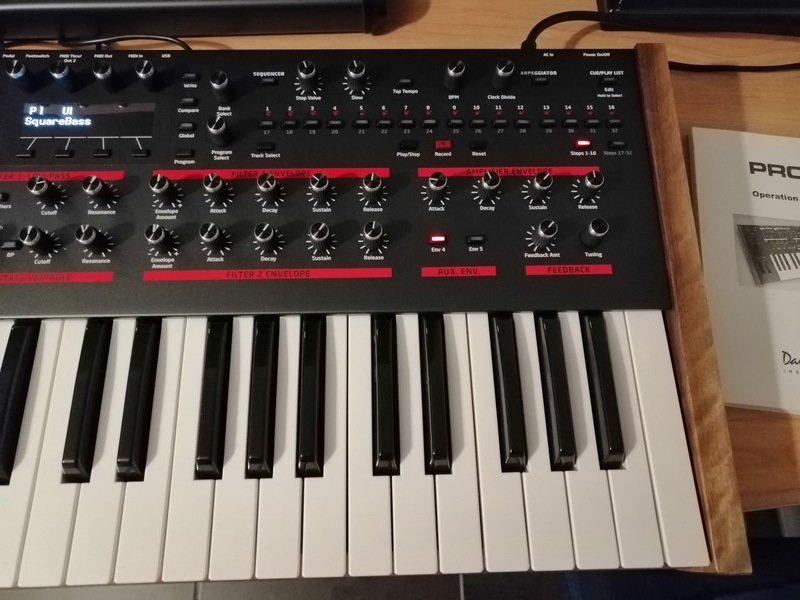 The Pro 2 as its name suggests is, therefore, the son &#39;&#39; legitimate &#39;&#39; Pro 1 released in 1980. Already at the opening of the carton and unpacking the Pro2 is very attractive shipping with him part of the dress of the Prophet 12. A black metal formwork for the surface and wood for the sides and bottom, 65 knobs, lighting buttons (50), a quality screen with scrolling snapshot of current functions, a power supply ° worthy of the name and very clear sense of solidity. The use is easily done when one has some knowledge synthesis (otherwise it will be much longer). Dave Smith Machinery users find their mark for sure, here we are in familiar territory. The many knobs allow for very rapid on many functions and very fluid display scrolls values ​​with ease. In short, the grip is exemplary at all levels. For once the manual seems to me more to his advantage than on previous models of the brand. More didactic and with a better approach of the device. To be honest I did not really open, everything seemed coherent enough without having to leaf through. The sound editing is extremely simple two pressures sweet ... "write &#39;&#39;. The sound is a very important data on a device like the Pro 2 because as the name suggests, it makes sense to proceed with the Pro 1, published in 1980. So what is it really? With 4 oscillators Sub Osc 1, the machine has a nice head start on what is usually done in the competition (between 1 and 3 soc max °) so it has a good chance of seeing the landscape. Because in addition to four waveforms proposed Pro 2 has 13 &#39;Superwave&#39; that is fairly new form of additional waves in this type of keyboard &#39;Tines&#39;,&#39; Melow &#39;,&#39; church &#39;Muted&#39; , Nasal &#39;etc ... and it clearly extends the sonic palette of the instrument. But it&#39;s not finished yet because each one is entitled to Osc 3 type of noise &#39;white&#39;, &#39;rose&#39;, purple. " Besides the 5 envelopes available: 2 filters, 1 for the VCA and 2 Auxiliary. So yes the sound is there and without hesitation I can say that nothing wrong name. I have a Pro 1 and I had the curiosity to make the play side by side. Surprise! The Pro 2 at breakneck potato and not be ashamed beside one ancestor, far from it. In the deep bass was quite similar and that dry grain shipment, pregnant feel good! They are well on generations of innovations that separate and Dave Smith much progress as the technology of its synthesizers. 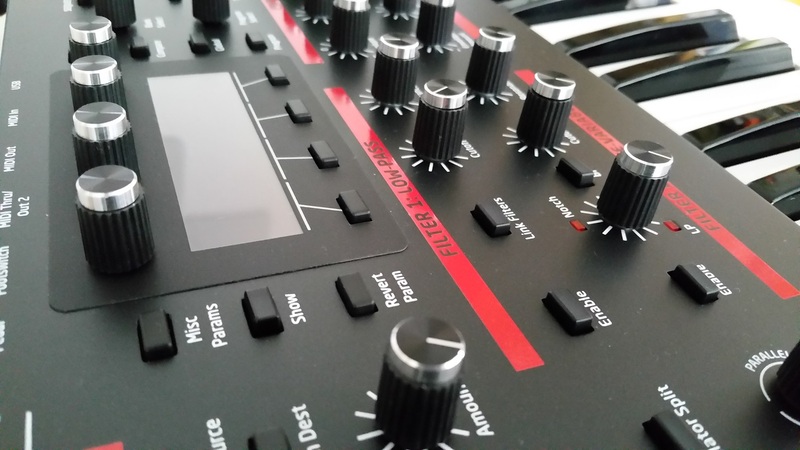 The integration of a dual filter based on the Prophet 5 and Oberheim SEM allows the Pro2 range of environments or merge ... since we can use these two filters simultaneously with 4 oscillators (in mode &#39;serial &#39;or&#39; parallel &#39 . The arpeggiator does its job (very good by the way) as usual so RAS signal on that side. 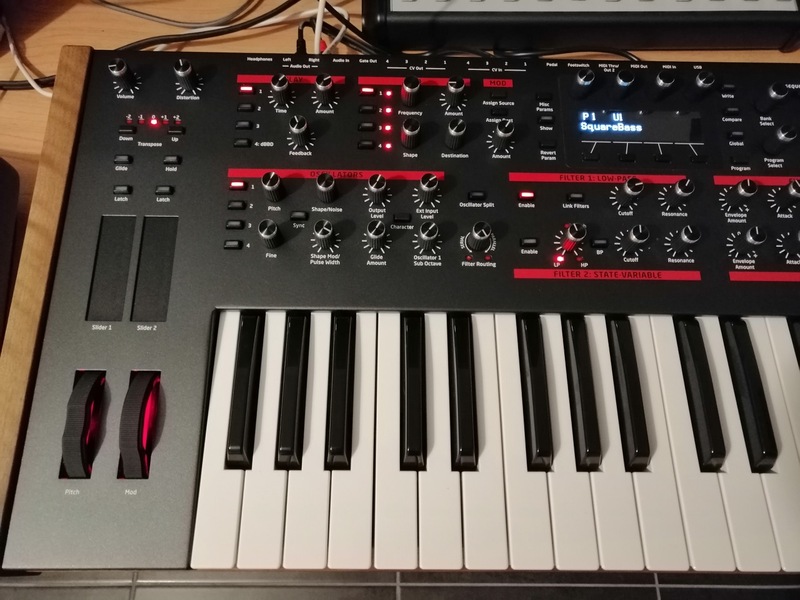 The sequencer as usual with DSI is particularly successful with a marked improvement in its programming since it has the choice between the &#39;real time&#39; or &#39;step&#39;. The duration of sequencing from 16 to 32 and not casually that makes a real difference. The modulation matrix appears via the screen and allows all feasible routes without limit. The effect section provides a configurable and very thorough delay into 4 sections with a sensible faithfully reproduce an analog delay. For once I find this very relevant section and it gives great depth to certain sounds. And finally (?) The Pro2 offers 396 factory sounds and 396 user sounds, it still leaves quite a margin. Otherwise the factory sounds, like the Prophet 08, very successful and varied. Received from 24 and ... This is a direct slap! I had yet tried a few weeks ago with the P12 but the demo copy was already booked. There were 12 or Prophet me somewhat cooled by a little digital sound and no sequencer, the Pro2 downright me he packed and right from the first use. The feeling with a synth of this type (mono / hybrid) is extremely rare (large and massive sound, power, possibilities, finishes, robustness, flexibility, look)) to report it. The result is the impression of an extremely autonomous instrument and at ease on many points. Yet I had keyboards of all kinds but the Pro2 is an A SUMMARY of what we can do better today without denigrating Inheritance (The lined the Prophet) and assumed a renewed past. Thank you Dave, does not change your Pro2 is perfect like that! pgt's review (This content has been automatically translated from French)" Exc"
All Pro2 features are too numerous to list here, they are easily accessible on the site DaveSmithInstrument. However, the Pro2 has a hybrid design: 4 digital oscillators followed by two pure analog filters can be parallelized or serialized, 1 4-pole filter Type PROPHET 5 1 Fuel Type 2 POLES OBERHEIN SEM !!! (We are spoiled). The "polyphony" or rather "paraphonie" is 4 lanes (1 oscillator / channel). In the box found in the P2 +: 1 power cord, 1 manual. There are almost one button per function (50 knobs !!! + switches, two ribbons ...) it's magic to use, it's simple and powerful at the same time. The manual is very clear but not complete. In terms of editing sounds I can still talk. The SOUND bases are excellent bills, they are surprisingly diverse. It has both fat and caramelized LOW that subtle and brilliant leads. Sounds typed FM are also present! Not so surprising that it finally saw that can modulate an oscillator by another ... Some ORGANIC look great allow potential glimpse of the beast ... In addition, we take as much pleasure in playing This SYNTHE that look !!! I love all the sounds provided more certain than others, but none are bad. The keyboard is very expressive, we enjoy playing it very convenient Bass or Lead the way paraphonic deluded if you do not have at hand a polyphonic synth to play chords. 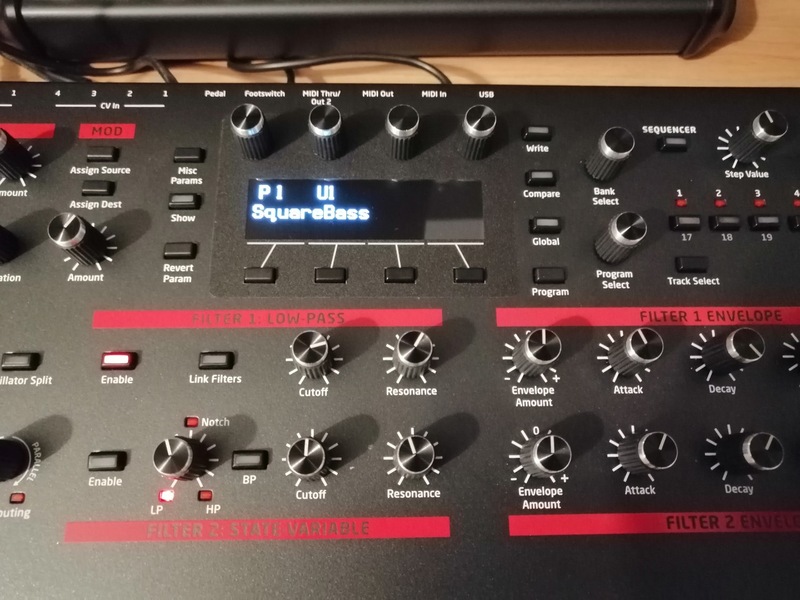 The keyboard is small indeed (time / distortion) and yet the sound is most excellent: I plan to add a rack effect, but it will take me to pick one up ??? I've had one day (I know it is not to have a definitive opinion, I will return to my opinion by one week or + if necessary). I had numerous instruments in the hands and between the ears, it was particularly moving to unpacking (it is beautiful) and SONNE DIVINELY. After a fews days teasing, Dave Smith finally unveils its new instrument, the Pro 2 hybrid mono synth.